Porter’s is a casual dining experience elevated by Chef Jaime Santiago’s passion for taking dishes and making them uniquely his own. Formerly the Sous chef at Porter’s in the Forest, working under Chef Johnny De Vivo, and Banquet Chef at Casanova in Carmel, Santiago heads a recently renovated dining room with 180 degree panoramic vistas of famed Poppy Hills Golf Course & Del Monte Forest, beautiful outdoor dining area with fire pits and glass enclosures, redesigned menu’s, and the best golf course snack bar in the industry. 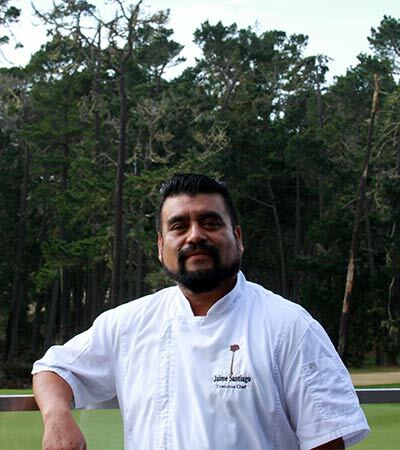 Chef Santiago comes from a background in fine dining, working with some of the best local chefs where he learned French & Italian cuisine. His passion for rustic, flavorful dishes was forged while leading the banquet team in Carmel at Casanova. Santiago’s skill at banquets highlights Porter’s in the Forests catering and banquet offerings, making Porter’s one of the best event locations in the Monterey Bay area.